A highlight of the week was my photo walk in Washington, D.C. 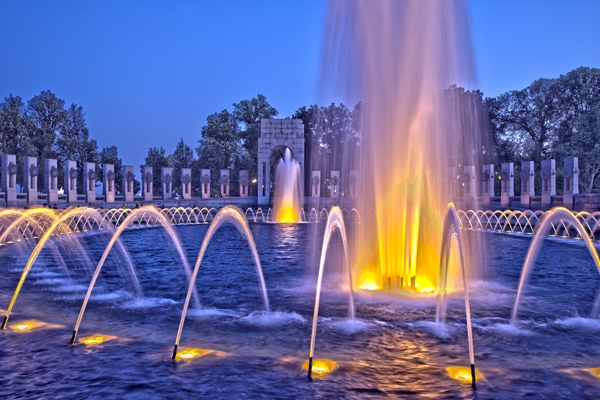 In editing photos today for work (and a few for play), I experimented with this HDR image of the National World War II Memorial in Washington, D.C. It was a gorgeous night for photography and even for simply watching the sunset over the Lincoln Memorial to the West, which drew many tourists. I as I set up my tripod and worked on compositions, I enjoyed listening to the many different accents and languages being spoken by people who walked through the memorial. Several groups also stopped and asked me to use their cameras to photograph them to document their experience. I enjoyed sharing in their moment, even though brief, and hope that they enjoy that photograph for years to come. We just moved from the area. I do love the monuments and you have captured this one well! Love it. Thanks for posting. Thank you! I hope you are enjoying your new home. I plan to return for another monument shoot in the next few weeks; I’d forgotten how much fun they are to shoot. last week i was watching a documentary about those fountains and it was just amaising..who do they work..and stuff..any way..really nice picture!! Thank you. They are beautiful fountains. I’ll have to keep an eye out for the documentary. It would be interesting to learn more about them. Much appreciated! Beautiful, Tricia! A great one for HDR! Thank you, Karen! I’ve enjoyed learning about HDR the past few weeks. It keeps the creative process fired up! I too love this memorial, I went at night and not only was the water and light fun to watch – I so enjoyed watching the people walk through this memorial. Exquisite photo Tricia! Thank you! This was the first time I’d been there at night. It was gorgeous, and I know what you mean about people watching. They added an intriguing aspect to the fountains and the shadows and lights.